A compact super light-weight 16/15 or 16/15c Hammer Dulcimer. Cherry bridges. 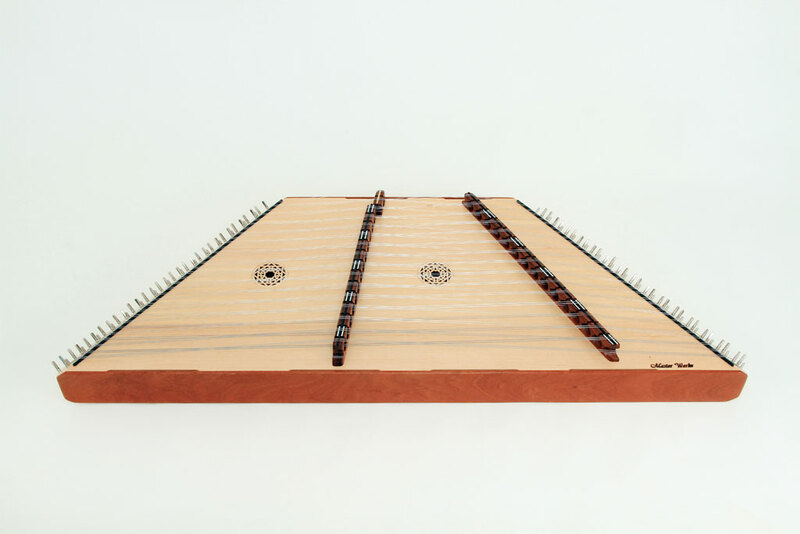 The Voyager hammer dulcimer is, basically, a 16/15 tuning pin pattern squeezed very carefully onto a 15/14 pinblock which means the body is the size of a 15/14. Our customers have been so pleased with the voice of the full-sized 15/14 model that we took another look at how to better serve our customers using its basic design, developing an even lighter weight chromatic instrument to carry around for busy daily performing duties. Because the body is a bit smaller than a 16/15, the bridges come to the very edge of the instrument. We are very precise in clamp-up to push the internal endrails (hidden behind the external endrail – visible from the handle port in the back) to the very end of the pinblock and then, as minimally as possible, grind the endrail surface flat, then glue the external endrail onto that surface covering the internal endrail and end-grain of the pinblocks. The body ends up ever so slightly deeper than a regular 15/14 from wide endrail to short endrail. But this process is just the beginning! The internal endrails are thinned and honeycombed to lighten the body. The bracing is sugar pine, lighter than spruce. The back is made of sugar pine. The soundboard is made of spruce or western red cedar, both extremely light compared to mahogany. Most importantly, the pinblocks are trimmed slightly and hollowed out internally to remove more than a pound from the weight of the instrument without any structural effect whatsoever. When sanding down the body, we grind off all external corners including the long outside corners of the pinblocks thus removing excess maple that has no structural purpose. Some of these processes only remove 1 – 3 ounces but by doing it everywhere and in any way possible, as much as 5 pounds disappears!!! That’s as much as 40%!! Combine that with a bit smaller case then add a sit-down stand made of sugar pine and you are now incredibly portable!